Altaf Husain is a native of Cleveland, Ohio, and a double alumnus of Case Western Reserve University in Cleveland, Ohio, having earned his B.S. in Biomedical Engineering and hi s M.S. in Social Work. He moved to the DC area in January 1998 from Ohio and chose to live near and attend the Dar Al Hijrah Islamic Center. He received his PhD in Social Work from Howard University in Washington, D.C. Dr. Husain’s research interests include the mental health and integration of immigrant and refugee families, and especially Muslim adolescents, in the United States. 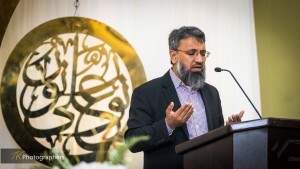 He serves as Vice President of the Yaqeen Institute for Islamic Research and advisory board member of the Peaceful Families Project -dedicated to the prevention of domestic violence. His past service to the community includes serving two terms as vice president of the Islamic Society of North America (ISNA), two terms as national president of the Muslim Students Association (MSA National) and an executive committee member of the Muslim Alliance in North America (MANA). Dr. Husain and his family live in Northern Virginia.